Jennifer I Lim MD, John Davis Akkara MD, K. David Epley, M.D. and Vinay A. Shah M.D. Assigned status Up to Date by Jennifer I Lim MD on March 14, 2019. Retinitis pigmentosa (RP) is a clinically and genetically heterogeneous group of inherited retinal disorders characterized by diffuse progressive dysfunction of predominantly rod photoreceptors, with subsequent degeneration of cone photoreceptors, and retinal pigment epithelium (RPE). Visual impairment usually manifest as night blindness and progressive visual field loss. Its prevalence is 1:3000 to 1:5000. RP may be seen in isolation (typical RP) or in association with systemic disease. This article focuses on typical RP with a brief mention of rare but treatable types of RP. The term retinitis pigmentosa (RP) is semantically inaccurate in that inflammation(implied by the suffix -itis) is not a prominent part of the pathophysiology of the condition. The disorder is actually a dystrophy or genetically determined degeneration and not an inflammatory disorder. Since RP is a collection of many different genetic disorders, the etiology is quite variable. However, the final common pathway appears to be photoreceptor cell death by apoptosis (rods followed by cones). There are no known risk factors for RP other than genetic predisposition. RP may occur as an isolated sporadic disorder, or be inherited as autosomal dominant, autosomal recessive or X-linked. Many cases are due to mutation of the rhodopsin gene. RP may also be associated with certain systemic disorders which are usually autosomal recessive. There are many genes associated with RP for which a patient can undergo genetic testing. Association with RPE65 is important as there is genetic therapy available which is effective for young patients. Histopathologic studies suggest that RP results from a primary defect in the rod and cone photoreceptors. Pathologic findings of an enucleated eye in a patient with autosomal recessive RP showed that the rod and cone outer segments were shortened and disorganized in the patient’s best field of vision, while in the area of visual loss; there was total loss of outer segments and a decrease in photoreceptors number. Two types of pigmented cells were found invading the retina: typical RPE cells that were migrating away from the retinal pigment epithelial layer, and macrophage-like cells that contained melanin. These changes were thought to be a reactive response to photoreceptor damage, since the RPE appeared relatively normal morphologically in areas of early photoreceptor involvement. A recent review described histopathologic findings in 10 patients with autosomal dominant RP, including poorly organized, shortened or absent outer segments with shortened inner segments. Inclusion bodies and/or perinuclear cytoplasmic membranous swirls were found in three cases. The pathophysiology of RP has been studied in several animal models. In the rat, retinal degeneration caused by failure of retinal pigment epithelium to phagocytose the shed rod outer segment discs, leading to accumulation of rod outer segement debris. In mice homozygous recessive for retinal degeneration mutation, rod photoreceptors stop to develop and undergo degeneration before cellular maturation completes. A defect in cGMP-phosphodiesterase, which leads to toxic level of cyclic guanosine monophosphate, has also been documented. This is also found to be true in some autosomal recessive models of the dog. It is unknown whether the defect in these animal retinal degenerations is the pathophysiologic mechanism of human retinitis pigmentosa. More than 100 gene loci that cause RP have been mapped or identified. Genes that cause RP can be categorized into those that affect the phototransduction cascade, the retinoid cycle, photoreceptor structure, or other biological function of photoreceptor and retinal pigment epithelium. The most frequent known causes are mutations in the rhodopsin (phototransduction cascade), USH2A (photoreceptor structure), or RPGR (maintenance of cilia or ciliated cells with possible role in trafficking) genes. Patients with the same gene defect can have variable severity of disease at a given age. Despite recent advances, about 50% of cases still have an unknown molecular genetic basis. There is genetic treatment for RPE 65 defects in children. Since RP is a genetic disorder, there is currently no intervention that would prevent manifestations of RP. In general, the diagnosis of retinitis pigmentosa is established when the following findings are present. Progressive loss in photoreceptor function. Patients with RP characteristically develop night blindness and difficulty with mid-peripheral visual field in adolescence. Timing of onset can vary among pedigrees. As their condition progresses, they lose mid-peripheral followed by far-peripheral visual field, but often maintain central vision until the very end stage of the disease. The classic clinical triad of RP is arteriolar attenuation, retinal pigmentary changes (could be either hypopigmentation and/or hyperpigmentation in form of bone-spicule and pigment clumpings), and waxy disc pallor. The characteristic pigmentary changes occur in the mid-peripheral fundus, which is predominantly populated by rods. There is often a high degree of symmetry in the fundus findings between the two eyes. Other common signs include vitreous cells, depigmentation and atrophy of the RPE, posterior subcapsular cataracts, cystic macular lesions, and refractive errors including myopia and astigmatism. Patients typically presents with night vision problems (unable to see in the dark or slow to adjusting to dark), progressive peripheral vision restriction, and tunnel vision at later stage of the disease. It is rare for patients to lose all vision in both eyes. In a large study involving close to 1,000 patients with RP and Usher Syndrome at age 45 or older, one fourth of the patients had a visual acuity of 20/200 or worse in both eyes, and more than half had a visual acuity of 20/40 or better in at least one eye. Only 0.5% of patients were completely blind in both eyes. In one study, about 50% of RP patients reported having headaches, and 35% of RP patients reported light flashes. Full-Field Electroretinogram (ERG): ERG measures the electrical potential generated by rods and cones after a light stimulus and is essential in the diagnosis of RP. The most important parameters being measured include a- and b-wave amplitudes and implicit times. In early stages of the disease, there is reduction in a- and b-wave amplitudes but implicit time can be prolonged or normal. Patients with advanced stages have non-detectable ERG. Dark adaptometry (DA): Visual threshold is the minimum intensity of light that will stimulate the rods or cones to elicit a subjective response. Dark adaptometry measures the absolute threshold of rods at given time intervals as the retina adapts to the dark. In RP, there is increased absolute rod threshold and dark adaptation is usually prolonged. This test maybe useful in detecting early cases. Visual field: Kinetic perimetry with Goldmann perimeter characteristically shows a ring scotoma in the mid-periphery of the visual field. They usually start as a group of isolated scotomas around 20 degrees from fixation, and gradually coalesce to form a partial followed by a complete ring. The outer edge of the ring expands relatively quickly to the periphery, while the inner edge constricts slowly toward fixation. Patients often have good central vision from a small central island (“tunnel vision”) until their 50’s or 60’s. Visual field testing is useful in monitoring the progression of disease and document the status of legal blindness. Electrooculogram (EOG) is a measurement of standing potential between the cornea and the retina and is a measurement of function of the RPE and photoreceptors. It is usually abnormal in RP. However, ERG is considered a more sensitive test for detection of photoreceptor function and consequently EOG is not routinely done. Optical coherence tomography (OCT): OCT is a quick, inexpensive, and widely available tool to detect cystic macular lesions, epiretinal membrane, and vitreomaular traction syndrome observed in some RP patients with decreased central vision. One study also showed mild inner retinal layer thinning and severe outer retinal layer thinning using spectral domain OCT.
Fluorescein angiography (FA): FA may have a role in documenting early deterioration of the retinal pigment epithelium and especially in female carriers of X-linked RP. It has a role in patients with cystic macular lesions and exudative vasculopathy. Genetic testing can be helpful in confirming the diagnosis. The Carver Nonprofit Genetic Testing Laboratory at the University of Iowa provides affordable genetic testings for the most common mutations in RP and other hereditary retinal diseases. Other laboratory testings that can be helpful in differentiating atypical cases of RP from other ocular disorders include serologies for syphilis, serum ornithine level or ornithine-lysine ratio (for gyrate atrophy of the retina and choroid), and serum phytanic acid level (for Refsum disease). Other genetic disorders that cause retinal degeneration include gyrate atrophy, choroideremia, cone-rod dystrophy, cone dystrophy, and Leber congenital amaurosis. Drug toxicity from thioridazine hydrochloride (Mellaril) can lead to diffuse pigmentary clumping and RPE atrophy, ring scotoma on visual field testing, and marked abnormality on ERG testing in later stages. Infectious causes including syphilis, rubella, and diffuse unilateral subacute neuroretinitis (DUSN) can cause similar pigmentary retinopathy seen in patients with RP. Patients with syphilis will have positive anti-treponemal antibody tests such as fluorescent treponemal antibody-absorbed (FTA-ABS) or microhemagglutination assay for Treponema pallidum (MHA-Tp) and should improve with proper treatment. Rubella is usually characterized by normal retinal vessels and normal visual function as documented by visual acuity, visual field, and ERG. DUSN is caused by a parasite and is classically unilateral. A worm can be found with careful examination of the fundus. Many treatments have been explored without proven benefit for the isolated forms of RP. These include various vitamins and minerals, vasodilators, tissue therapy with placental extract, cortisone, cervical sympathectomy, injections of a hydrolysate of yeast RNA, ultrasound, transfer factor, dimethyl sulfoxide, ozone, muscle transplants, and subretinal injections of fetal retinal cells. (ref) None of the above treatments were conducted in randomized, controlled clinical trials. It is important to note that anecdotal treatment with subjective improvement of visual function should be interpreted with caution due to fluctuation in visual acuity and visual fields in this disease. ERG is a better objective measure of remaining retinal function. Any potential therapy will likely require several years of follow-up to assess efficacy due to the nature of slow progression of this disease. Controversies exist regarding the use of high dose vitamin A, docosahexaenoic acid (DHA), and lutein to slow the progression of RP. Berson et al. conducted three large randomized, controlled, double-masked trials. In the first study, 601 adult patients were randomized to one of four treatment groups: vitamin A, 15,000 IU/day plus vitamin E 3 IU/day; vitamin A 75 IU/day plus vitamin E, 3 IU/day; vitamin A, 15,000 IU/day plus vitamin E, 400 IU/day; and vitamin A, 75 IU/day plus vitamin E, 400 IU/day. The main outcome variable was the 30-Hz cone flicker ERG. In summary, patients who are on the higher dose of vitamin A had the slowest annual rate of decline in remaining ERG amplitude (8.3% of decline per year) while those on high dose vitamin E had the fastest (11.8%). The results were more significant in the cohort with higher amplitudes to start with (i.e., > 0.68 μV). In the second study, patients who were given vitamin A palmitate 15,000 IU/day were randomized to either DHA capsules (1200 mg/day) or control fatty acid capsules. The main outcome variable was the total point score of the 30-2 Humphrey visual field. Overall, DHA supplementation by capsules did not slow the course of RP over a 4-year interval (p=0.88). However, for those who are taking vitamin A for the first time, a subgroup analysis concluded DHA supplement slowed the rate of visual field loss and log ERG amplitude loss in years 1 and 2, but not in years 3 and 4 after the start of treatment. In the third study, they evaluated the supplemental effects of lutein 12 mg/day combined with high dose vitamin A and high dietary intake of DHA on the rate of RP visual field loss. The investigators reported no difference between groups in the rate of decline in the total point score for the HFA 30-2 program (primary outcome measure, p=0.66), nor loss of HFA 30-2 plus 60-4 total point score, logERG amplitude, and logMAR visual acuity (secondary outcomes). However, they did report a significant effect of treatment on the rate of decline for the HFA 60-4 total point score (secondary outcome, p=.05). Based on these studies, the authors concluded that patients with RP would benefit from taking 12 mg of lutein per day in addition to 15,000 IU/d of vitamin A and weekly meals of oily fish, of which DHA is a major component. However, there were some debates regarding these recommendations. For example, members of the Data and Safety Monitoring Committee from the first study reported that much of the originally reported significant difference was a consequence of pooling the data and could be attributed to early and consistently large differences between the vitamin E group and all of the other groups. In the 2nd and 3rd study, conclusions were drawn based on secondary outcomes and subgroup analyses, rather than primary outcome. Therefore, the use of high dose vitamin A and other supplements must be weighed against their potential side effects (see complications). The precise mechanism by which vitamin A supplementation provides its benefit is not known. It has been speculated that vitamin A rescues remaining cones, thereby explaining how one supplement may help a group of patients with different rod-specific gene defects. Vitamin E may lead to an adverse effect on the course of RP by inhibiting the absorption or transport of vitamin A. DHA is thought to facilitate the release of vitamin A from its carrier protein (interphotoreceptor retinoid binding protein) in the subretinal space. Patients who develop cystic macular lesions (about 30%) may benefit from oral acetazolamide, topical dorzolamide drops, and intravitreal steroids in some cases. Anti-VEGF intravitreal injection has also been shown to be effective in a small case series. The long-term efficacy of topical dorzolamide in improving the macular cystic lesions in patients with RP and Usher syndrome has been been demonstrated in a retrospective series with a mean follow-up of 39 months. Although light deprivation has not been shown to be of benefit in altering the course of retinal degeneration, it is generally advisable for patients to use ultraviolet and short-wavelength (blue) blocking sunglasses for outdoor activities. Audiology consults should be considered for patients with possible or known diagnosis of Usher syndrome. Low vision services are designed to benefit those whose ability to function is compromised by visual impairment. A low vision examination may be useful to help optimize the use of remaining visual function. Genetic counseling can provide patients and families with information on the inheritance and implications of their genetic disorders and can help them make informed medical and personal decisions. Annual ocular examinations usually are sufficient to measure visual acuity and Goldmann visual field. If medical treatment is initiated, more frequent visits and laboratory blood work may be indicated. For example, patients with red blood cell (RBC) docosahexaenoic acid (DHA) level of at least 4% of total RBC fatty acids has been reported to have, on average, a slower rate of decline of visual field sensitivity than those with lower levels. Vitamin A levels and liver function tests should also be done annually if treatment has been initiated (see Complications). In patients with hereditary abetalipoproteinemia (Bassen–Kornzweig syndrome), mutations in the gene encoding a microsomal triglyceride transfer protein lead to depletion of vitamin A in the liver and the retina. A low-fat diet and supplementation of fat soluable vitamins A, E, and K are recommended. In patients with Refsum disease, they inherit a defective enzyme that can lead to accumulation of excess phytanic acid. Findings other than retinopathy include peripheral neuropathy and ataxia. Treatment consists of restricting food items that contain phytanic acid (including animal fats, milk products, and green leafy vegetables containing phytol) while maintaining body weight. Gene therapy: Although there is currently no cure for RP, well-characterized animal models and a developed understanding of the genetic basis of the disease allow gene therapy to be a potentially viable therapeutic strategy. For example, in the Rds mouse model which carries a mutation in Prph2, the rhodopsin promoted delivery of Prph2 rescues both ultrastructure and function in differentiated photoreceptors. In the Rd mouse, which carries a cyclic GMP phosphodiesterase (PDE) mutation, expression of this gene prolongs photoreceptor survival and induces a twofold increase in light sensitivity. In general, better improvements are generally seen in younger mice compared to adult mice. In humans, retinal gene therapy mediated by adeno-associated virus (AAV) based gene transfer was shown to be safe and effective in improving photoreceptor function in some patients with an inherited retinal blinding disorder associated with mutations in the RPE65 gene known as Leber Congenital Amaurosis. While this is very exciting for autosomal recessive diseases with well defined genetic mutations, one big challenge for RP is the heterogeneous nature of genetic mutations. For example, in autosomal dominant forms of RP, where one mutant allele causes disease, researchers must develop strategies to knock down expression of the mutated allele, while adding the normal allele by gene transfer. For those patients suffering from RP with unknown mutations, an AAV based transfer of bacterial forms of rhodopsin in the central retina might be an option to reactivate residual cones in the future. There is now an FDA approved Humanitarian Device, called the ARGUS II implant, which may help patients with end-stage RP. It is approved for use in patients with bare light to no light perception. It consists of 3 parts: a video recorder, a transmitter and the implant itself. The implant is an epiretinal electrode chip coated in silicone that stimulates the retina electrically. It is connected to a silicone strip that carries the electrodes from the receiver. This strip encircles the eyeball and is surgically sewn onto the sclera. The wireless receiver receives electrical signals from a video recorder which is mounted to glasses on the patient's face. The video unit converts the video images into electrical impulses which are transmitted to the receiver. The retinal stimulation results in the patient seeing lines or dots of light that indicate edges or objects in the patient's field of vision. The patient does not see in color and the resolution does not allow for "seeing faces or small details." Prior research on the ARGUS II showed that patients are better able to find doors, walk along a path and identify the location and movement of objects with the device turned "on" than without the device. In patients with another form of RP, Leber's variant, gene therapy for RPE 65 is being performed. This technique requires the injection of the gene into the eye, specifically into the space under the center of the retina (macular subretinal space). Replacement of the gene in younger patients (versus adults) has allowed patients to gain vision. This treatment (Luxturna drug) is produced by Spark Therapeutics. If the patient develops a cataract, it is generally advisable to defer surgical removal until the patient can no longer read with the better eye. In one study of 30 patients with RP, 83% improved by 2 lines on the Snellen visual acuity chart with cataract surgery. In general, toxicity from vitamin A treatment is rare. As a safety measure, patients should have a pretreatment assessment of fasting serum vitamin A levels and liver function and annually thereafter. Because of the potential for birth defects, women who are pregnant or planning to conceive are advised not to take high doses of vitamin A (15,000 IU/day). In older adults, long-term vitamin A supplementation has been associated with a decrease in bone density and up to a 1% increased risk of hip fractures. Therefore, postmenopausal women and men over the age of 49 who are taking vitamin A should consult with their primary care physician regarding their bone health. Patients with renal failure or renal transplant should not take vitamin A due to excessive renal re-absorption. Finally, vitamin A should not be given to patients on chronic doxycycline because the combination can lead to increased intracranial pressure. The 5 year study of the ARGUS II Implant supports the long term safety and benefit of the implant for those blind from RP. A collaborative has also recently published their recommendations to optimize patient outcomes. Most common complications are conjunctival erosion and hypotony. It is rare that the implant would require removal. Some studies suggest that the rate of progression, age of onset, and eventual visual loss are related to the mode of inheritance. Autosomal dominant RP has the best prognosis, with the majority of patients under 30 years having visual acuity of 20/30 or better. X-linked is the most severe form with appreciable impairment of central visual acuity to 20/200 or less by the fifth decade of life. Autosomal recessive and sporadic cases were intermediate in severity. In terms of visual field loss, a study of 104 patients with autosomal dominant RP shows 93% of patients under age 20, 89% of those from 20-40, and 60% over the age of 40 had a central visual field radius of 10 degrees or greater with the IV4e test object. In addition to references, Stephen J. Ryan's textbook recommended the following texts: chapters by Lang & Maumenee and Newsome in Newsome's Retinal Dystrophies and Degenerations, two chapters by Heckenlively in his book Retinitis Pigmentosa, the review article "Retinitis pigmentosa," by Roberta Pagon,6 and Carr & Heckenlively's chapter in Clinical Ophthalmology. The molecular genetics of RP is extensively covered in a number of chapters in Molecular Genetics of Inherited Ocular Disorders, edited by Alan Wright and Barrie Jay. Chapter 66, "Degeneration and atrophy of the choroid," in Duane's Clinical Ophthalmology discusses many diseases that either can be confused with RP and allied disorders or enter into the differential diagnosis. Boyd K, Vemulakonda GA. Retinitis Pigmentosa. American Academy of Ophthalmology. EyeSmart® Eye health. https://www.aao.org/eye-health/diseases/retinitis-pigmentosa-list. Accessed March 25, 2019. American Academy of Ophthalmology. Pediatric Ophthalmology/Strabismus: Retinitis pigmentosa and associated syndromes Practicing Ophthalmologists Learning System, 2017 - 2019 San Francisco: American Academy of Ophthalmology, 2017. ↑ Weleber RG, Gregory-Evans K. Retinitis pigmentosa and allied disorders. In: Ryan SJ, ed. Retina, 4th edn. Philadelphia, PA: Elsevier; 2006:394-485. ↑ Mizuno K, Nishida S: Electron microscopic studies of human retinitis pigmentosa. Part I. Two cases of advanced retinitis pigmentosa. Am J Ophthalmol. 1967;63(4):791-803. ↑ Bunt-Milam AH, Kalina RE, Pagon RA. Clinical-ultrastructural study of a retinal dystrophy. Invest Ophthalmol Vis Sci. 1983;24(4):458-469. ↑ Ben-Arie-Weintrob Y, Berson EL, Dryja TP. Histopathologic-genotypic correlations in retinitis pigmentosa and allied diseases. Ophthalmic Genet. 2005;26(2):91-100. ↑ Pagon RA. Retinitis Pigmentosa. Surv Ophthalmol. 1988;33(3):137-177. ↑ 6.0 6.1 6.2 6.3 Berson EL. Retinitis Pigmentosa and Allied Diseases. In: Albert D, Miller J, Azar D, Blodi B, eds. Albert and Jakobiec, 3rd edn. Philadelphia, PA: Elsevier; 2008:Ch. 177. ↑ Marmor MF, Aguirre G, Arden G, et al. Retinitis pigmentosa, a symposium on terminology and methods of examination. Ophthalmology. 1983;90(2):126-131. ↑ Kanski J. Retinitis Pigmentosa. In: Kanski J, Sehmi K, Bolton A (eds.) Clinical Ophthalmology: A Systemic Approach, 6th edn. Philadelphia, PA: Elsevier; 2008:Ch. 18. ↑ Grover S, Fishman GA, Anderson RJ, et al. Visual acuity impairment in patients with retinitis pigmentosa at age 45 years or older. Ophthalmology. 1999;106(9):1780-1785. ↑ Heckenlively JR, Yoser SL, Friedman LH et al. Clinical findings and common symptoms in retinitis pigmentosa. Am J Ophthalmol. 1988; 105(5):504-511. ↑ Alexander KR, Fishman GA. Prolonged rod dark adaptation in retinitis pigmentosa. Br J Ophthalmol. 1984;68(8):561-569. ↑ Grover S, Fishman GA, Brown J Jr. Patterns of visual field progression in patients with retinitis pigmentosa. Ophthalmology. 1998;105(6):1069-1075. ↑ Lim JI, Tan O, Fawzi AA, et al: A pilot study of Fourier-domain optical coherence tomography of retinal dystrophy patients. Am J Ophthalmol. 2008;146(3):417-426. ↑ Berson EL, Rosner B, Sandberg MA, et al: A randomized trial of vitamin A and vitamin E supplementation for retinitis pigmentosa. Arch Ophthalmol. 1993; 111(6):761-772. ↑ Massof RW, Finkelstein D: Supplemental vitamin A retards loss of ERG amplitude in retinitis pigmentosa. Arch Ophthalmol. 1993; 111(6):751-754. ↑ Berson EL, Rosner B, Sandberg MA, et al: Vitamin A supplementation for retinitis pigmentosa. Correspondence Arch Ophthalmol. 1993; 111(11):1456-1459. ↑ Berson EL, Rosner B, Sandberg MA, et al: Clinical trial of docosahexaenoic acid in patients with retinitis pigmentosa receiving vitamin A treatment. Arch Ophthalmol. 2004; 122(9):1297-1305. ↑ 18.0 18.1 Berson EL, Rosner B, Sandberg MA, et al: Further evaluation of docosahexaenoic acid in patients with retinitis pigmentosa receiving vitamin A treatment: Subgroup analyses. Arch Ophthalmol. 2004; 122(9):1306-1314. ↑ Berson EL, Rosner B, Sandberg MA, et al. Clinical trial of lutein in patients with retinitis pigmentosa receiving vitamin A. Arch Ophthalmol. 2010;128(4):403-411. ↑ 20.0 20.1 Massof RW, Fishman GA. How strong is the evidence that nutritional supplements slow the progression of retinitis pigmentosa? Arch Ophthalmol. 2010;128(4):493-495. ↑ Norton EWD. A randomized trial of vitamin A and vitamin E supplementation for retinitis pigmentosa [letter to the editor]. Arch Ophthalmol. 1993;111(11):1460. ↑ Marmor MF. A randomized trial of vitamin A and vitamin E supplementation for retinitis pigmentosa [reply letter]. Arch Ophthalmol. 1993;111(11):1460-1461. ↑ Cox SN, Hay E, Bird AC: Treatment of chronic macular edema with acetazolamide. Arch Ophthalmol. 1988; 106(9):1190-1195. ↑ Grover S, Apushkin MA, Fishman GA: Topical Dorzolamide for the treatment of cystoid macular edema in patients with retinitis pigmentosa. Am J Ophthalmol. 2006; 141(5):850-858. ↑ Yuzbasioglu E, Artunay O, Rasier R, et al. Intravitreal bevacizumab (Avastin) injection in retinitis pigmentosa. Curr Eye Res. 2009;34(3):231-237. ↑ Genead MA, Fishman GA. Efficacy of sustained topical dorzolamide therapy for cystic macular lesions in patients with retinitis pigmentosa and Usher syndrome. Arch Ophthalmol. 2010;128(9):1146-1150. ↑ Berson EL: Light deprivation and retinitis pigmentosa. Vision Res. 1980;20(12):1179-1184. ↑ Narcisi TME, Shoulders CC, Chester SA, et al: Mutations of the microsomal triglyceride-transfer-protein gene in abetalipoproteinemia. Am J Hum Genet. 1995;57(6):1298-1310. ↑ Refsum S: Heredopathia atactica polyneuritiformis: A familial syndrome not hitherto described. Acta Psychiatr Neurol Scand. 1946;38(Suppl):1. ↑ Liu MM, Tuo J, Chan C-C. Gene therapy for ocular diseases. Br J Ophthalmol. 2011;95(5):604-612. ↑ Ali RR, Sarra GM, Stephens C, et al. Restoration of photoreceptor ultrastructure and function in retinal degeneration slow mice by gene therapy. Nat Genet. 2000;25(3):306-310. ↑ Jomary C, Vincent KA, Grist J, et al. Rescue of photoreceptor function by AAV mediated gene transfer in a mouse model of inherited retinal degeneration. Gene Ther. 1997;4(7):683-690. ↑ Sarra GM, Stephens C, De AM, et al. Gene replacement therapy in the retinal degeneration slow (rds) mouse: the effect on retinal degeneration following partial transduction of the retina. Hum Mol Genet. 2001;10(21):2353-2361. ↑ Bainbridge JW, Smith AJ, Barker SS, et al. Effect of gene therapy on visual function in Leber’s congenital amaurosis. N Engl J Med. 2008;358(21):2231-2239. ↑ Hauswirth WW, Aleman TS, Kaushal S, et al. Treatment of Leber congenital amaurosis due to RPE65 mutations by ocular subretinal injection of adeno-associated virus gene vector: short-term results of a phase I trial. Hum Gene Ther. 2008;19(10):979-990. ↑ Stieger K, Lorenz B. Gene therapy for vision loss -- recent developments. Discov Med. 2010;10(54):425-433. ↑ Sieving PA, Caruso RC, Tao W, et al. Ciliary neurotrophic factor (CNTF) for human retinal degeneration: phase I trial of CNTF delivered by encapsulated cell intraocular implants. Proc Natl Acad Sci USA. 2006;103(10):3896-3901. ↑ Talcott KE, Ratnam K, Sundquist SM, et al. Longitudinal study of cone photoreceptors during retinal degeneration and in response to ciliary neurotrophic factor treatment. Invest Ophthalmol Vis Sci. 2011;52(5):2219-2226. ↑ Birch DG, Bennett LD, Duncan JL, Weleber RG, Pennesi ME. Long-term Follow-up of Patients With Retinitis Pigmentosa Receiving Intraocular Ciliary Neurotrophic Factor Implants. Am J Ophthalmol. 2016 Oct;170:10-14. ↑ Humayun MS, Weiland JD, Fujii GY, et al. Visual perception in a blind subject with a chronic microelectronic retinal prosthesis. Vision Res. 2003;43(24):2573-2581. ↑ Chow AY, Pardue MT, Perlman JI, et al. Subretinal implantation of semiconductor-based photodiodes: durability of novel implant designs. J Rehabil Res Dev 2002;39(3):313-321. ↑ Ghodasra DH, Chen A, Arevalo JF, Birch DG, Branham K, Coley B, Dagnelie G, Juan ED; Devenyi RG, Dorn JD, Fisher A, Geruschat DR, Gregori NZ, Greenberg RJ, Hahn P, Ho AC, Howson A, Huang S, Iezzi R, Khan N, Lam BL, Lim JI, Locke KG, Markowitz M, Ripley AM, Rankin M, Schimitzek H, Tripp F, Weiland JD, Yan J, Zacks DN, Jayasundera KD, Jayasundera KT. Worldwide Argus II Implantation: Recommendations to Optimize Patient Outcomes. BMC Ophthalmology 2016;16(1):52. ↑ da Cruz L, Coley BF, Dorn J, Merlini F, Filley E, Christopher P, Chen FK, Wuyyuru V, Sahel J, Stanga P, Humayun M, Greenberg RJ, Dagnelie G; Argus II Study Group. The Argus II epiretinal prosthesis system allows letter and word reading and long-term function in patients with profound vision loss. Br J Ophthalmol 2013 May;97(5):632-6. ↑ Luo YH, Zhong JJ, da Cruz L. The use of Argus® II retinal prosthesis by blind subjects to achieve localisation and prehension of objects in 3-dimensional space. Graefes Arch Clin Exp Ophthalmol. 2014 Dec 31. [Epub ahead of print]. ↑ Stronks HC, Dagnelie G. The functional performance of the Argus II retinal prosthesis. Expert Rev Med Devices. 2014 Jan;11(1):23-30..
↑ Bastek JV, Heckenlively JR, Straatsma BR. Cataract surgery in retinitis pigmentosa patients. Ophthalmology 1982;89(8):880-884. ↑ Feskanich D, Singh V, Willett WC, Colditz GA: Vitamin A intake and hip fractures among postmenopausal women. JAMA. 2002;287(1):47-54. ↑ Michaelsson K, Lithell H, Vessby B, Melhus H: Serum retinol levels and the risk of fracture. N Engl J Med. 2003;348(4):287-294. ↑ deCruz et al. Five-Year Safety and Performance Results from the Argus II Retinal Prosthesis. Ophthalmology. 2016 Oct;123(10):2248-54. ↑ Ghodasra DH, et al. Worldwide Argus II implantation: recommendations to optimize patient outcomes. BMC Ophthalmol. 2016 May 6;16:52. doi: 10.1186/s12886-016-0225-1. ↑ Fishman GA. Retinitis pigmentosa. Visual loss. Arch Ophthalmol. 1978;96(7):1185-1188. ↑ Fishman GA, Farber MD, Derlacki DJ. X-linked retinitis pigmentosa. Profile of clinical findings. Arch Ophthalmol. 1988;106(3):369-375. ↑ Lyness AL, Ernst W, Quinlan MP, et al. A clinical, psychophysical, and electroretinographic survey of patients with autosomal dominant retinitis pigmentosa. Br J Ophthalmol. 1985;69(5):326-339. ↑ Lang GE, Maumenee IH. 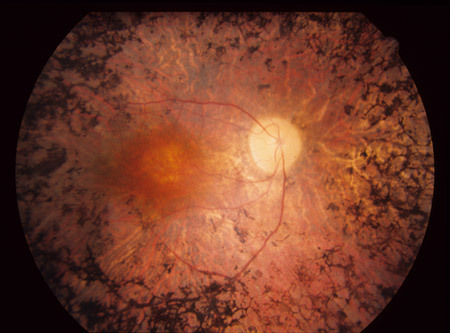 Retinal dystrophies associated with storage disease. In: Newsome DA, ed. Retinal dystrophies and degenerations. New York, NY: Raven Press;1988:319-340. ↑ Newsome DA. Retinitis pigmentosa, Usher's syndrome, and other pigmentary retinopathies. In: Newsome DA, ed. Retinal dystrophies and degenerations. New York, NY: Raven Press; 1988:161-194. ↑ Heckenlively JR. Autosomal recessive retinitis pigmentosa: preserved para-arteriolar retinal pigment epithelial RP. In: Heckenlively JR, ed. Retinitis pigmentosa. Philadelphia, PA: JB Lippincott; 1988:151-154. ↑ Heckenlively JR. RP syndromes. In: Heckenlively JR, ed. Retinitis pigmentosa. Philadelphia, PA: JB Lippincott; 1988:221-252. ↑ Carr RE, Heckenlively JR. Hereditary pigmentary degenerations of the retina. In: Duane TD, Jaeger EA, eds. Clinical ophthalmology. Philadelphia, PA: JB Lippincott; 1987:1-28. ↑ Wright AF, Jay B, eds. Molecular genetics of inherited eye disorders. Switzerland: Harwood Academic Press;1994. This page was last modified on March 26, 2019, at 17:03.